The Milk Carton Kids On Mountain Stage The minimalist folk duo makes its first appearance on the show, recorded live in Charleston, W.V. The Milk Carton Kids on Mountain Stage. 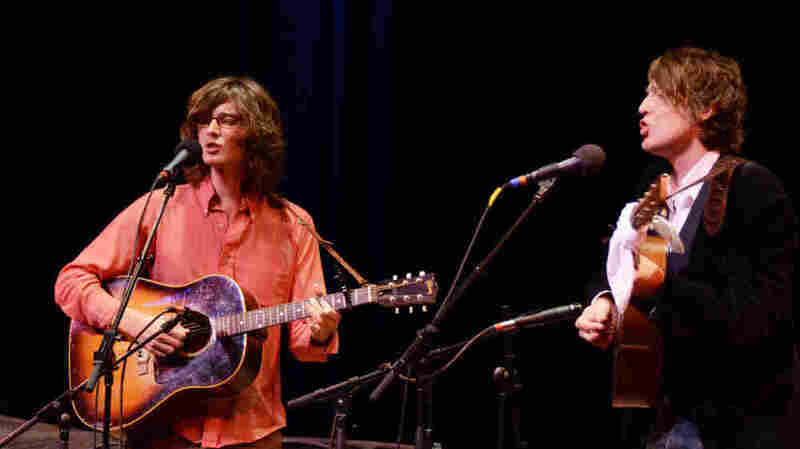 "I Still Want a Little More"
Minimalist folk duo The Milk Carton Kids makes its first appearance on Mountain Stage, recorded live in Charleston, W.V. Singer-songwriters Joey Ryan and Kenneth Pattengale were pursuing their own solo careers when a serendipitous meeting led to full-time collaboration and a lovely new album titled Prologue. The duo opens its set with the lush, atmospheric tune "Michigan," which immediately showcases the qualities that make this band stand out: tight harmonies and shimmering melodies set against intricate, driving guitar. The result calls to mind some of music's most celebrated folk pairings; comparisons to Simon & Garfunkel and The Jayhawks write themselves, while Pattengale's blazing, country-infused picking will no doubt remind some of David Rawlings' work with Gillian Welch. Prologue is available for free download on The Milk Carton Kids' website. This segment originally aired on December 21, 2011.